Who doesn’t love a pizza? I would qualify that question by saying I mean a good pizza, a wood fired oven baked thin crust pizza, with traditional/classic Italian toppings. None of these wierdo flavour combos toppings (don’t get me started on how wrong I think pineapple on a pizza is) or deep pan monstrosities and there is no place in this Universe (in my view) for the hideous abomination that is the stuffed (full of rubbish) crust. Whoever came up with the cheeseburger stuffed crust pizza should burn forever more in hell (just my opinion). 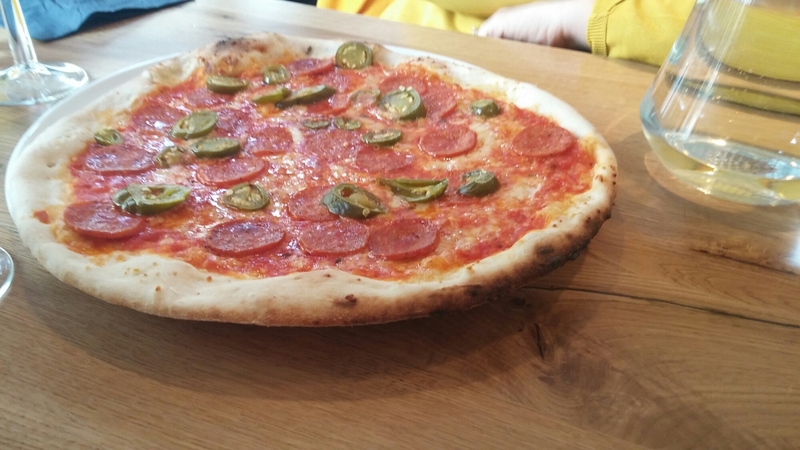 Cardiff on the pizza front already does pretty well, with Cafe Citta, Anatonis, Porro, Calabrisella and more recently Locke & Remedy. 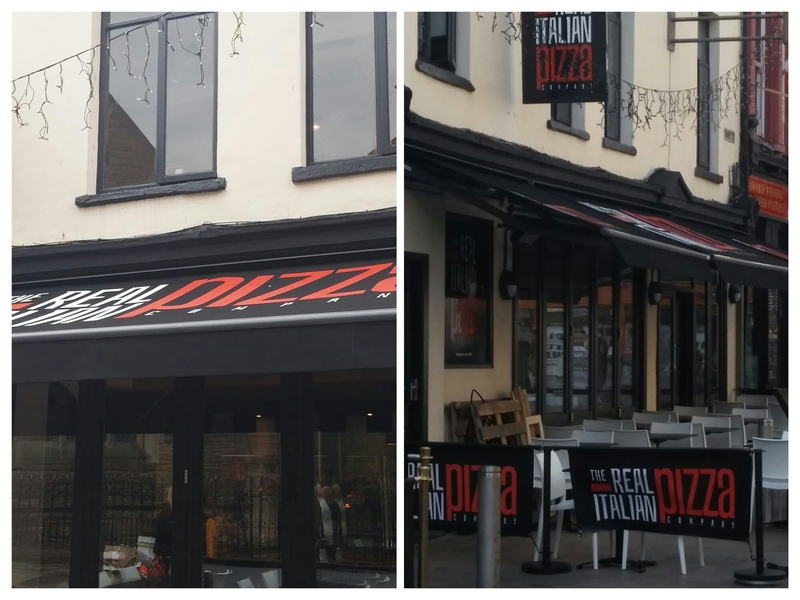 Now we also have the newly opened “Real Italian Pizza Company”, a Bath based outfit, whose website claims they make pizzas “the traditional Italian way”. With such a name and stated ethos, I had high expectations of reliving a simple (just a very good tomato sauce, buffalo mozzarella and fresh basil leaves on top of a thin crispy base), but amazingly good pizza in a place called La Lanterna on the Amalfi Coast (can still taste it now). 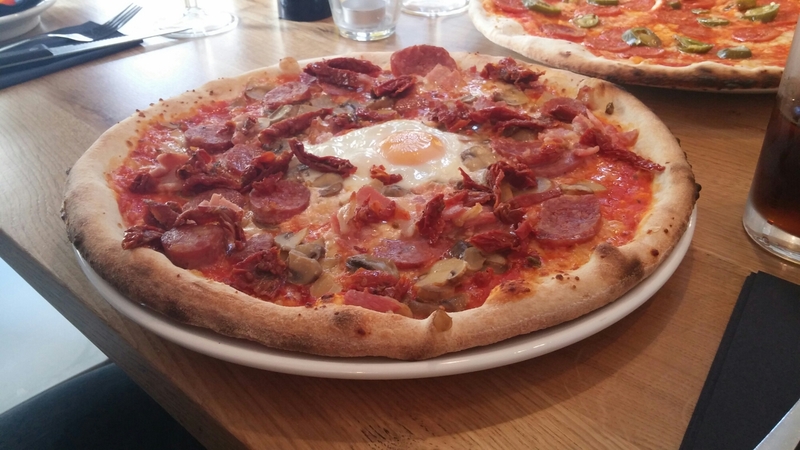 It was chosen as the venue (the Real Italian Pizza Company, not La Laterna – I wish) for a work lunch to welcome a couple of new starters to the team, as everyone likes pizza. This was rain checked as one was off sick and the other already too busy to come, but a few of us decided to go anyway as we had not brought in our packed lunches in anticipation of going out!! The place, recently opened in what use to be Munchesters on the top of the Hayes (just up from the market), seems already to be a bit of a hit on Tripadviser with (at the time of writing) 5s across the board. Whilst I take Tripadviser reviews (both good and bad) with a large pinch of salt, this can’t be seem as anything other than quite a good indication. 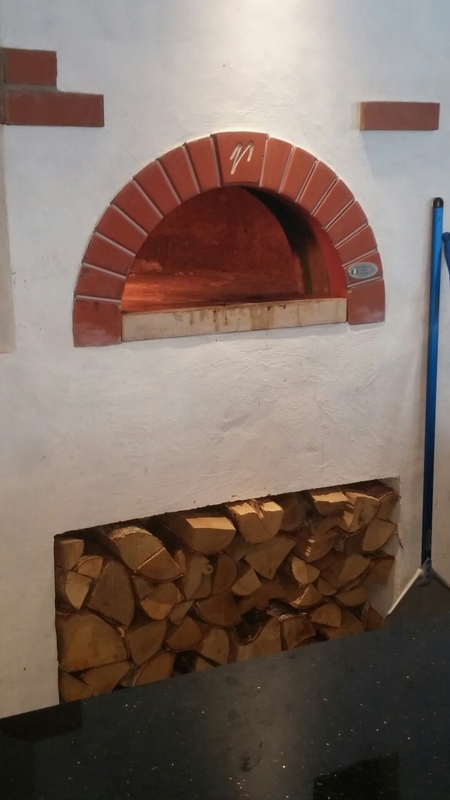 Inside, the wood burning pizza ovens (x2) are in full view and mightly impressive they are too. Seriously want one. The kitchen is open and I love the logs inbuilt into the counter separating the kitchen from the eating area. 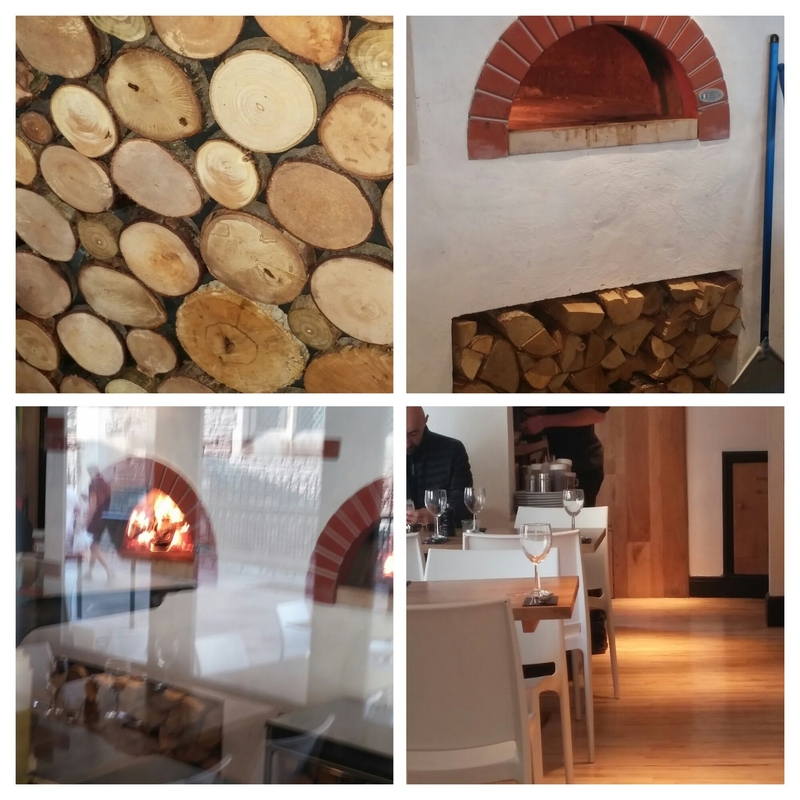 Inside it is quite clinical – lots of white and pine and I can’t believe how spotless it is (bearing in mind the two wood burning ovens). It is quite small downstairs, with the open kitchen taking out alot of space and the dining area a galley sort of layout alongside and to the side of the kitchen. There are more seats up stairs and it apparently has 100 cover (which from the size downstairs amazes me). I thought the interior quite nice if a bit cold looking (if you get what I mean) even with two pizza ovens roaring away. as well as nibbles, starters and salads. 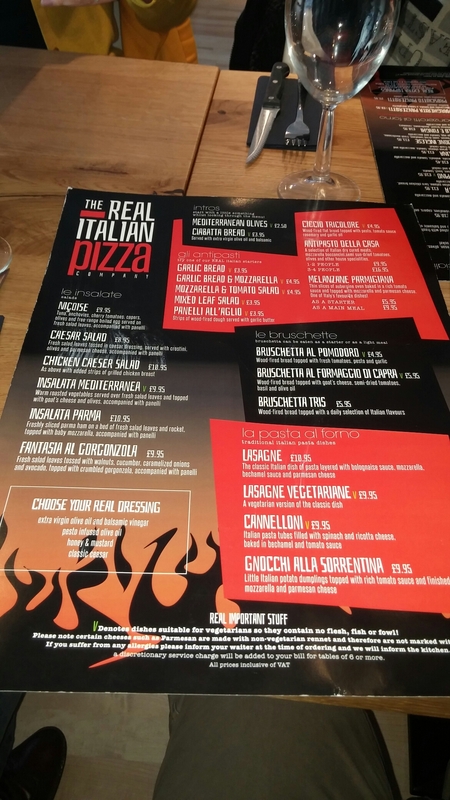 All sound rather nice, but we were there for the main focus of the menu, thin crust pizzas served straight out of a wood fired pizza oven. I am not one for fancy exotic toppings on pizzas, but do like many people’s bête noire, the anchovy (can’t understand why so many people dislike them – I absolutely love the little beauties). On this basis, I went for the Napolitana (£10.95), a traditional cheese and tomato pizza, with the addition of salty and sour in the form of black olives, capers and anchovies. This was a fine looking pizza and big old beast for a lunch time meal. Its sheer size, as against the plate, made cutting it a tricky exercise for someone as cack handed as me. The base was a beautiful thing, being crisp (hate a soggy bottom on a pizza – well pretty much on anything actually), with that lovely sound of a properly cooked pizza base when I tapped it with my knife. 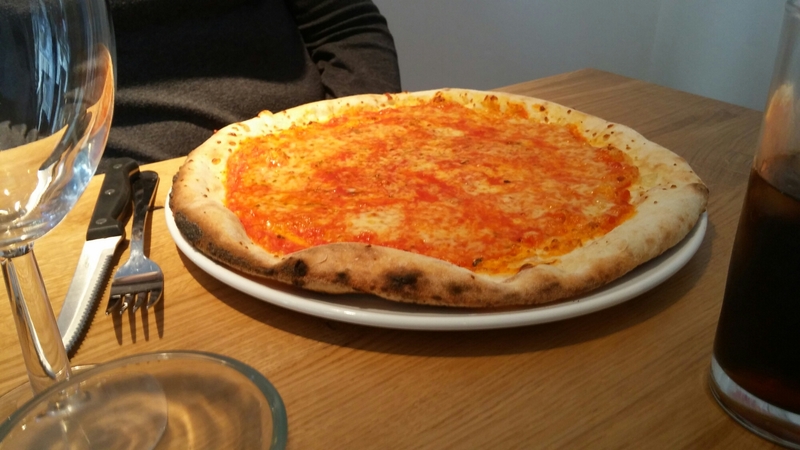 Was it as good as the pizza perfection delivered to me on the Amalfi coast? No, but it was still pretty good. The base tomato sauce had a good flavour to it and had not been too liberally applied (I like that). 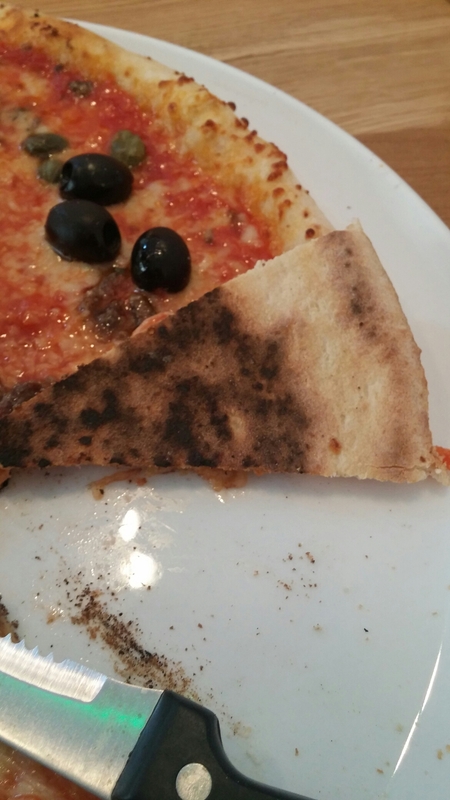 The cheese on the top was the right molten consistency (grated rather than my preference of slices of mozzarella), but the whole thing was not volcanic hot (so no burnt roof of the mouth). 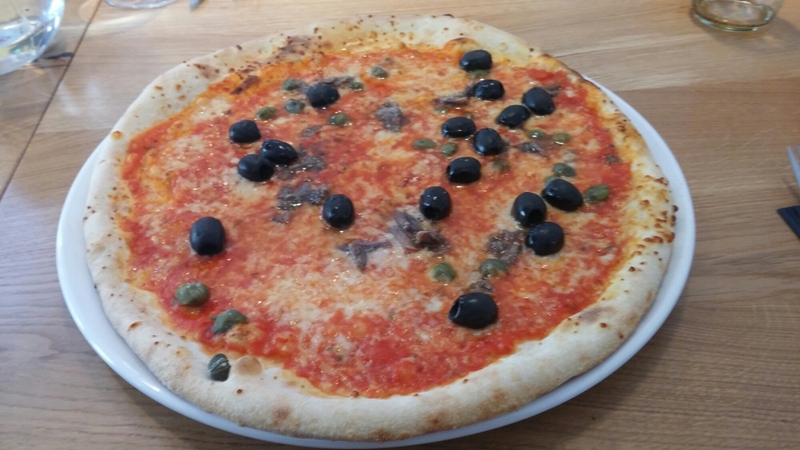 My only quibble was a somewhat uneven distribution of the olives, capers and anchovies. 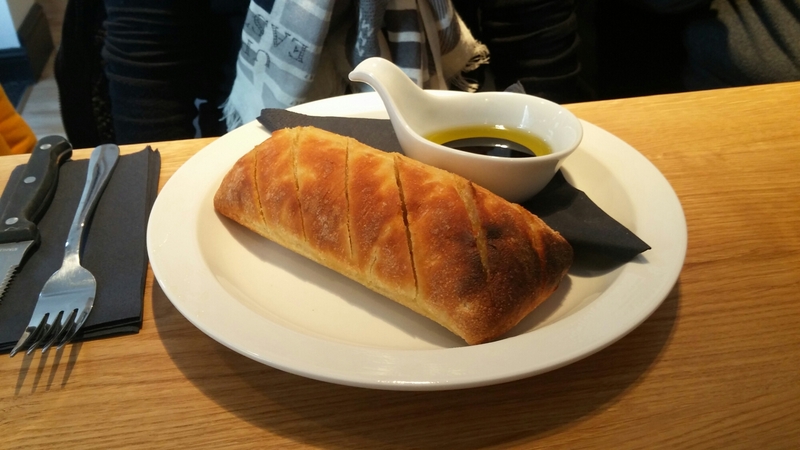 Fine if having one to yourself – more tricky if sharing. All were pronounced as excellent. 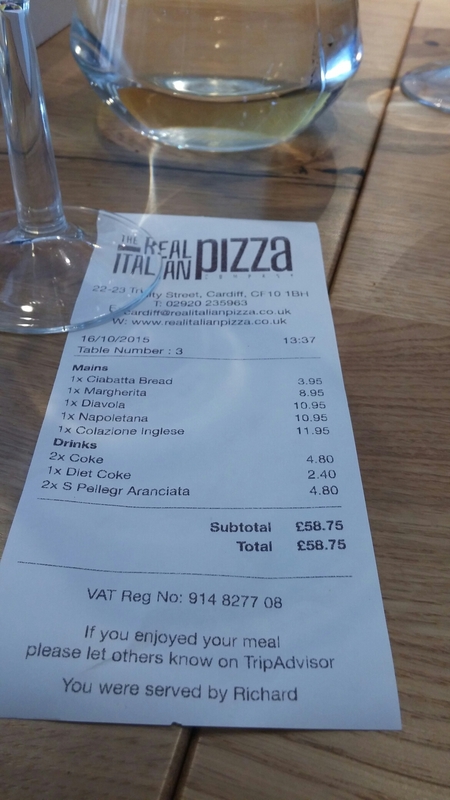 Personally the Colazonie Inglesa looked a bit fussy to me (too much going on for my simple tastes in pizzas), but the person who ordered it was happy enough. 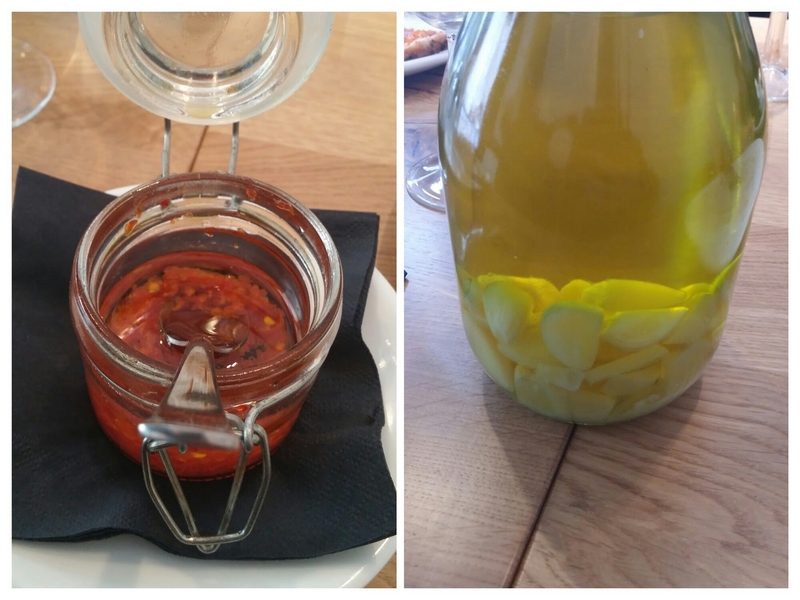 Garlic and chilli oils were offered, as was extra cheese. All in all a great selection of very good pizzas. We skipped on desserts and I didn’t get sight of the menu. I assume it has all of the usual Italian classics (gelato, tiramisu etc). As it was a work day lunch we all went for soft drinks, which included the usual suspects and a standard Italian offering in the form of cans of San Pellegrino. I went for the San Pellegrino aranciata (orange), others boring coke. Water was brought to the table unprompted. 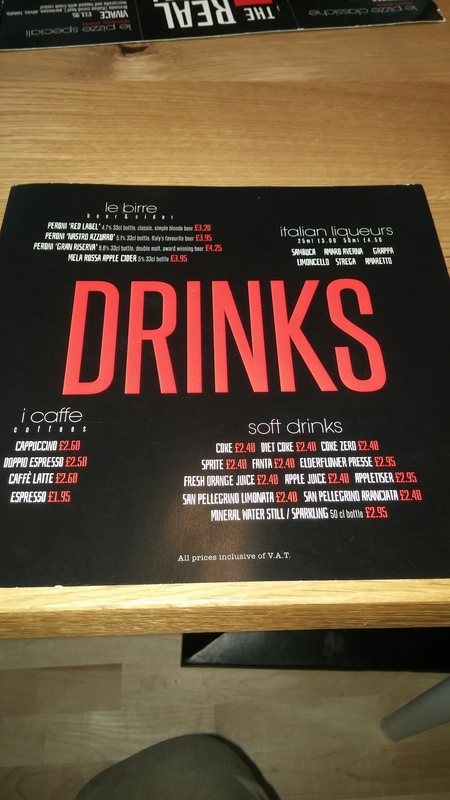 Have to say I think the softs drinks are quite pricey at £2.40 for both coke and the San Pellegrino. Very nice margin being made on both (I can get 24 cans of the San Pellegrino for around 40p a can at Costco so that is a whopping £2.00 margin per can over wholesale!!!). On the booze front they have a nice selection of Italian wines which go well with pizza (Chianti and. Montepulciano d’Abuzzo being classic pizza wines) Shame no Campania wines (an area including the spiritual home of pizza, Naples) mind. 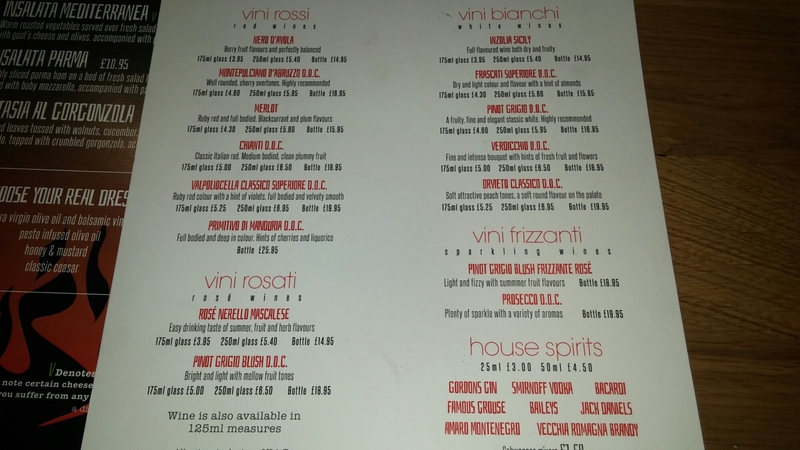 There are also a few Italian beers (and a cider called Mela Rossa – Italian cider being a new one on me) and liqueurs. None of the wines are too pricey, with the most expensive a nice muscular Primitivo (good with the meat based pizzas and meaty non pizzas dishes) at just over £26. It is nice to see all but one (the Primitivo) of the red and white wines sold by the glass. Does seem a shame they don’t go the whole hog and just offer all of the wines (bar maybe from the fizzes) by the glass. A rather liked the Real Italian Pizza Company, which delivers good authenic thin crust pizzas. Services was also very good – attentive but not obtrusive. A pizza box was swiftly provide for the remains of the diavolo which my friend Rachel couldn’t quite all eat (strange that as she isn’t usually shy is finishing stuff off 🙂 – I might get a punch for that ). It is, however, quite pricey for a midweek lunchtime meal. I suppose two people could easily share one pizza to cut the cost and half of one of their pizzas would probably do me for lunch (but that doesn’t work if eating solo). I do think a cheaper and smaller lunch time pizza would be an idea as the standard size is quite big for lunch and not cheap when compared to other offers in town of a lunchtime. This would perhaps draw in more of the lunch time crowds (it was a bit quiet on our visit). Just a thought. Would I go back? Yes definitely. I love a proper pizza. I would, however, perhaps be encouraged to go back more often of a lunchtime if they offered a smaller, cheaper pizza for lunch. 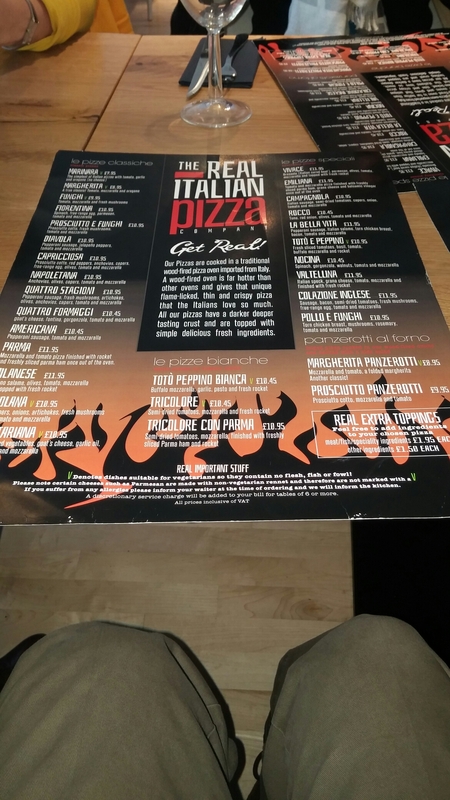 This entry was posted on Oct 18, 2015 by solicitingflavours in Cardiff, Cardiff restaurant, coffee, Drink, Food, Food and wine products, italian, Italian wine, Italy, lunch, lunchtime, New restaurant Cardiff, Non alcoholic drink, pizza, Real Italian Pizza Company, Red Wine, Restaurant Review, review, Wales, White wine, wine.